This Saturday we drove to Toronto for the opening of the Scotiabank Nuit Blanche* Group Show at The Elaine Fleck Gallery. After a 7 hour drive (yeah, normally it's about 6 hrs but we ran into some traffic on the way... roadworks... sigh...), a quick dinner at a cool TexMex place and a coffee at the White Squirrel, we walked over to the gallery, which is located on 888 Queen West Street. The event started at 7pm and it was already getting dark. We approached the gallery from across the street and the first thing I saw through the windows was my painting 'Summer Stroll' which, because of the lighting and the high contrast, seemed to jump off the wall! So Cool! The Elaine Fleck Gallery has a very nice mix of brick and white walls. My piece was placed on a piece of the brick wall, which worked really, really well. Group shows like this can sometimes be a little crowded or all over the place but this show is really, really well curated, everything just flowed. 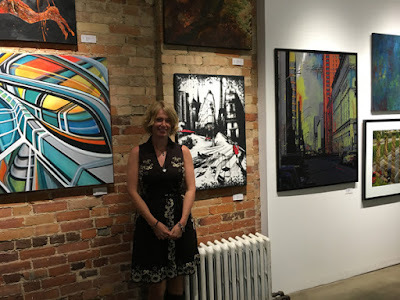 I've attended quite a few opening nights (or vernissages as well call them here in Montréal), I have some experience, but The Elaine Fleck Gallery is one of the top galleries in Toronto so I was a little nervous. Totally unnecessary of course! Everyone was super nice! I was greeted warmly by the gallery owner and felt right at home! I met some amazing artists who I definitely hope to meet again and had an awesome time! All too soon it was time to say goodbye and find our hotel, which was located near the airport because of insanely high rates in the downtown area. When we arrived at our hotel we got another nice surprise, a free upgrade to a suite with hot-tub! Score! That was a nice treat! Usually I'm not a soaker tub person but a little soak in the hot tub after a 7 hour drive is pretty awesome! The Scotiabank Nuit Blanche Group Show will be up for another two weeks (until October 18, 2015) so if you're in the Toronto area you should definitely go check it out! The Elaine Fleck Gallery is located at 888 Queen West Street. The show includes works by Amy Shackleton, Kathy Kissik, Lloyd Arbour, Karen Colangelo, Kristyn Watterworth, Jaqueline Veltri, Corin Ford Forrester and many other talented artists who's work was featured in the Fleck Fine Art Fall/Winter 2015 Catalogue. * Nuit Blanche is an annual all-night or night-time arts festival. A Nuit Blanche will typically have museums, private and public art galleries, and other cultural institutions open and free of charge, with the centre of the city itself being turned into a de facto art gallery, providing space for art installations, performances (music, film, dance, performance art), themed social gatherings, and other activities.